Everyone knows what a cigar is â€“ or do they? Most people have heard of and seen cigars but not everyone knows all that much about cigars. If you are one of them and want to know more about cigars, then you are in the right place! Over the next few weeks, we are going to go through a starter course â€“ or a refresher course, if you wish â€“ to get to know cigars. So where do we start? Anyone can merely go to a cigar store and pick out a box of cigars. 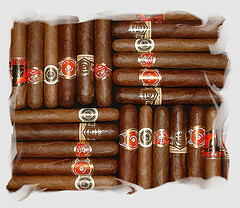 That, however, does not guarantee that he will pick out good quality cigars that would suit his taste and preferences. With hundreds, maybe even thousands of choices, the task of picking a cigar â€œblindâ€ can be quite daunting. So what indicators should one look at? The color of the cigar is a good place to start. There is no hard and fast rule when it comes to color but the general rule of thumb is that the darker the wrapper of the cigar, the stronger the flavor. So, if you are smoking a cigar for the first time, you may want to pick out one that has a lighter wrapping. Oscuro â€“ very dark brown, almost black; very strong flavor. In the next post, weâ€™ll look at another indicator, which is the size of a cigar.